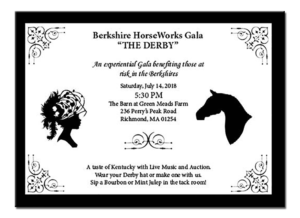 Berkshire HorseWorks, Inc 2018 Events! Join Monica Celli-de Movellan, MA Ed, RYT of Equus Yoga, for an all levels, Mindful Flow. Nurture your body and mind while you delight your senses as the horses graze around you and day gives way to night. Schedule a private Yoga session with your house guests! This workshop is dedicated to Mindfulness. Allow the healing horses and donkeys lead you through the beautiful property of BHW. Learn tools to calm the nervous system, help ignite creativity, allow time to reflect, set goals, or just enjoy yourself in a new way with guided meditation, journalling, gentle yoga and horses as the catalyst. A taste of Kentucky with Live Music and Auctions. Wear your Derby hat or make one with us. Sip a Bourbon or Mint Julep in the tack room!